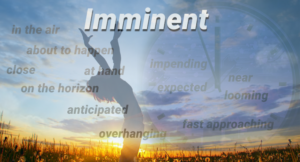 What does Imminent Really Mean? What does that mean? 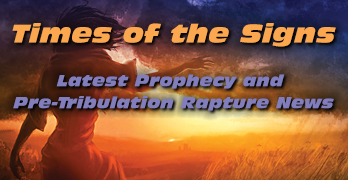 Was the return of Christ imminent for the apostles right after the ascension? Such a statement just doesn’t sound right. If asked, many people will say they believe the return of Christ is imminent, which they’ll explain as meaning that He can return at any moment. But is this an accurate usage of the word based on its definition? Imminent can mean ‘about to happen’, but the return of Christ wasn’t about to happen right after His ascension, so this definition cannot be rigidly applied. Imminent can also mean impending, close (at hand), near, (fast) approaching, coming, forthcoming, on the way, in the offing, in the pipeline, on the horizon, in the air, just around the corner, expected, anticipated, brewing, looming, threatening, menacing, or overhanging. In consideration of these synonyms, it appears that a better choice of definitions might be ‘fast approaching’, impending, on the way, or expected. None of these definitions are constrained by the idea that an event can happen at ‘any moment’, but do suggest an event that is approaching on God’s timeline which will happen at a specific time of His choosing. But no man knows the day or the hour! While I agree with this statement in a general sense, I don’t think most people understand what it really means. “But of that day and hour no one knows, not even the angels of heaven, but My Father only.”? But what day or hour was Jesus talking about? Was He talking about the day when heaven and earth would pass away which is described in the verse immediately preceding Matthew 24:36? Or was He talking about the Rapture or even the Second Coming? It’s interesting to note that in the original texts there was no separation of paragraphs as there is between Matthew 24:35 and Matthew 24:36 in Bibles today. Can the context be changed by separating two sentences with a paragraph break where there shouldn’t be one? It would appear so. While I’m not suggesting that anyone should be dogmatic about this alternate interpretation that results by removing the paragraph break, I do think it is worthy of consideration. But wait, there’s more…you’ve probably noticed that Mark 13:32 excludes the son from knowing ‘the day or the hour’. More than a few people struggle with this since Jesus is God in the flesh and God is all-knowing, so how could Jesus not know the day or the hour? One explanation is that Jesus was fully man and fully God and in his human nature wasn’t able to ‘know’. Another explanation that this verse is allegorical and symbolic of the traditional Jewish wedding betrothal and wedding. The son labors at constructing a room addition to his father’s house for his bride. It is the father who decides when the room is complete and satisfactory before he tells the son to go and fetch his bride. So in an allegorical sense, Jesus/Yeshua is the Groom, the Church is His Bride, and only the Father decides when it is time for the Son to bring His Bride home. Let’s assume for a moment that it is true that at the moment of Creation God set his own celestial clock into being. He ordained the balance of the Universe and the timing of the planetary orbits around the Sun. He established a method of measuring time by years and seasons based on the number of days required for the Earth to orbit the Sun with a day being the time required for the Earth to complete a revolution on its own axis. It has already been established in Leviticus 23 that God ordained seven special ‘Feasts’, known as ‘moedim’ in Hebrew. The word ‘moedim’ is more accurately translated as ‘appointed times’ since not all of these appointed times involved an actual ‘feast’. It’s not a matter of debate, we factually know from what is written in the Bible that the first four appointed times or appointments in God’s calendar were kept by Jesus/Yeshua to the very day. He was not late. The Holy Spirit came down from above on Pentecost or The Feast of Weeks, which is the fourth moed. ( Lev. 23:15 )The last three of the seven moed have not yet been correlated with any specific past events which involve Jesus/Yeshua which suggests that these appointments are still pending. If the pattern persists of Jesus/Yeshua not being late in keeping his first four appointments then it is reasonable to expect that he will not be late in keeping the last three appointments. But what are the last three moed about? How can they be related to upcoming events involving Jesus? Why is there such a big gap in time between when the Holy Spirit came down and today? Questions like these are best answered by looking to Biblical Prophecy. The large gap in time between Pentecost and today is a dispensation. A dispensation is simply a smaller period of time which results from dividing a larger period of time. The names most commonly applied to this particular dispensation that we are currently in are The Age of Grace or the Church Age. From a scientific point of view, there are 24 different time zones in the world. At any given moment the sun is setting in one part of the world while it is rising in another. For a small window of time each day, it is actually possible to have three different calendar days in effect based on the time zones and the International Date Line. Yes, it can simultaneously be Friday, Saturday, and Sunday on planet Earth. So this is one scientific explanation for why it can not be possible to know the ‘day’ or the ‘hour’ of Christ’s return. So 2,000 years is only two days to the Lord. Think about this. 4,000 years can be accounted for by adding the years from Adam to Jesus. 2,000 years can be accounted for by adding the years from Jesus to this day, making a total of 6,000 years which have come and gone. What comes after the sixth day? The seventh day of course. What did God proclaim the seventh day to be but the Day of Rest, or the Sabbath. How long is Jesus’ reign on Earth after His Second Coming? The answer, found in Revelation 20, is 1,000 years which would account for the seventh day. So by simply accounting for the summation of years based on Biblical history it’s easy to see that we are on the threshold of the seventh day right now. Jesus/Yeshua come quick. If there is a Bible passage which forbids trying to figure out the timing of the Lord’s return I’d like to see it. On the contrary, a crown of righteousness is promised to those who yearn for his appearing. For the grace of God that brings salvation has appeared to all men, 12 teaching us that, denying ungodliness and worldly lusts, we should live soberly, righteously, and godly in the present age, looking for the blessed hope and glorious appearing of our great God and Savior Jesus Christ, who gave Himself for us, that He might redeem us from every lawless deed and purify for Himself His own special people, zealous for good works. So what are the key takeaways from all of the verses above?